After three weeks, the eruption at Kilauea volcano’s lower East Rift Zone shows no signs of abatement. In fact, dramatic changes to the lava over the last few days suggest things are still heating up—literally. 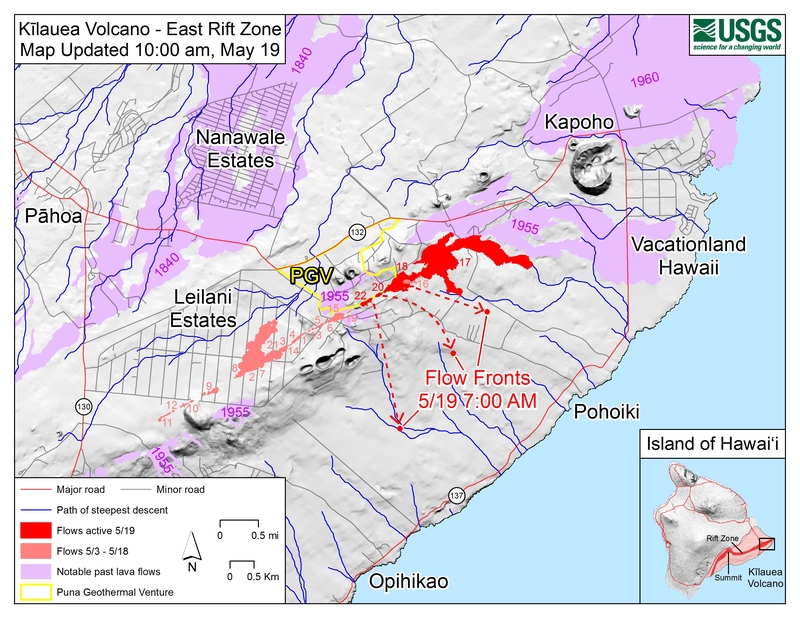 For the first few weeks, the lava oozing out of cracks in the lower East Rift Zone was making relatively small fountains and thick, slow-moving flows. But late last week, lava started gushing out at a much faster rate, shooting higher into the air, and flowing further downslope. Several flows migrated all the way to the ocean over the weekend, where they’re now forming new land. Concentrations of sulfur dioxide (SO2), a toxic gas released when lava erupts, tripled downwind of the rift zone on Sunday. Concord University volcanologist Janine Krippner told Earther that prior to last week, what was flowing out of the ground appeared to be “leftover” magma from older eruptions—slightly cooler stuff with less trapped gas, like a carbonated drink that’s been sitting open for a while. “Now what we’re seeing is fresher, [seemingly] hotter, more gas rich lava,” Krippner said. 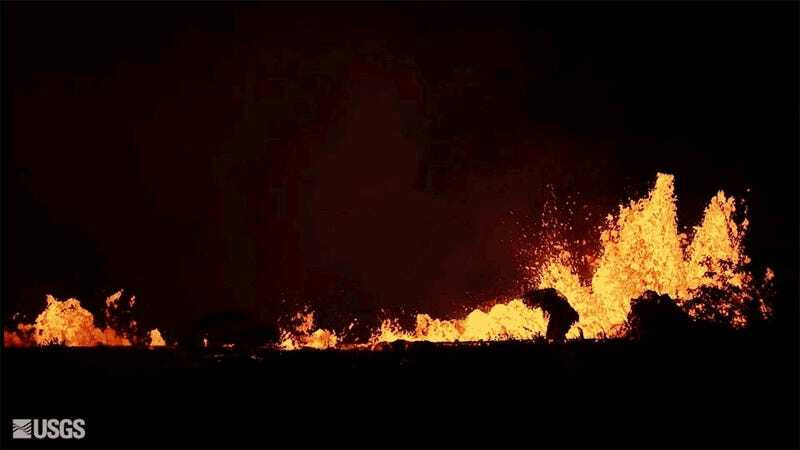 Poland said that scientists are currently sampling lava across the East Rift Zone to see how the erupting material is changing across space and time. But at this point, it’s clear that fresher stuff from further up rift—either from Puʻu ʻŌʻō cone or the summit crater—has arrived at the eruption site. 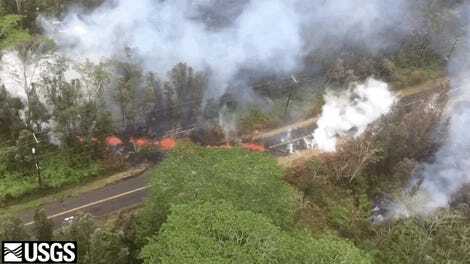 One early result that caught scientists’ attention was the composition of the lava initially coming out of Fissure 17 east of Leilani Estates. As USGS wrote in a Facebook reply, this stuff contained a much higher silica content than is typical for Kilauea, suggesting the magma had been sitting around and cooling off for a long time, allowing silica-poor minerals to crystallize out. Silica makes magma thicker, and can lead to more violent eruptions. In comparison, fresher lava produces taller fountains and flows faster. Poland noted that the 1955 eruption lasted several months, which gives us an indication of the sort of event we may be looking at. The eruption continues to pose new hazards. 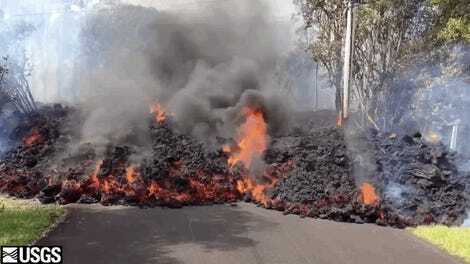 Those lava flows that reached the ocean over the weekend? They’re producing “laze,” noxious clouds of hydrochloric acid filled with tiny shards of glass, which sounds like the nightmare scenario from a college chemistry experiment gone awry. The elevated SO2 levels up the risk for the formation of volcanic smog or “vog.” And explosive eruptions are still occurring at the summit, sending volcanic ash far and wide. All of these can cause eye, skin, and lung irritation. This weekend also saw the first reported serious injury from the eruption. Lava spatter shattered a man’s leg while he was standing on a third flood balcony, according to the Washington Post.